I don't know about the "fat-burning" aspect of this soup, but it is one of my favorite soup recipes. Look for onion soup mix that doesn't have MSG added. I divide the leftovers into single serving containers and take for lunch. Place carrots, onions, tomatoes, cabbage, green beans, peppers, and celery in a large pot. Add onion soup mix, tomato juice, beef broth, and enough water to cover vegetables. 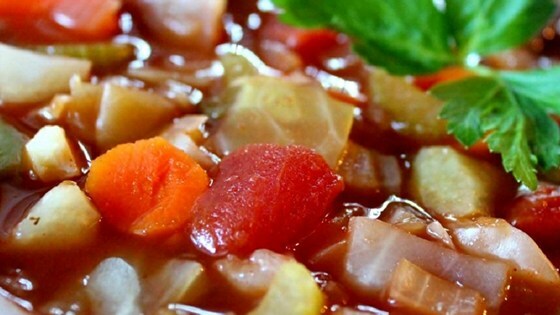 Simmer until vegetables are tender, 10-15 minutes. May be stored in the refrigerator for several days.